For years, economic and social observers have taken to redrawing our borders to better define our situation and to attempt to predict the future. Maybe you thought the global financial meltdown has raised anxiety levels in the United States quite enough. But a Russian professor’s decade old prediction of national disintegration suggests much worse on the way. Prof. Igor Panarin, a 50-year-old former KGB analyst and a dean of the Russian Foreign Ministry’s academy for future diplomats, estimates there’s a 45-55% chance that the United States will disintegrate like the Soviet Union did sometime in 2010. Mass immigration, economic decline and moral degradation will trigger civil war, the collapse of the dollar and massive social unrest. This in turn will lead to the U.S. breaking into six blocs — with Alaska reverting to Russian control – and other foreign powers grabbing other pieces. 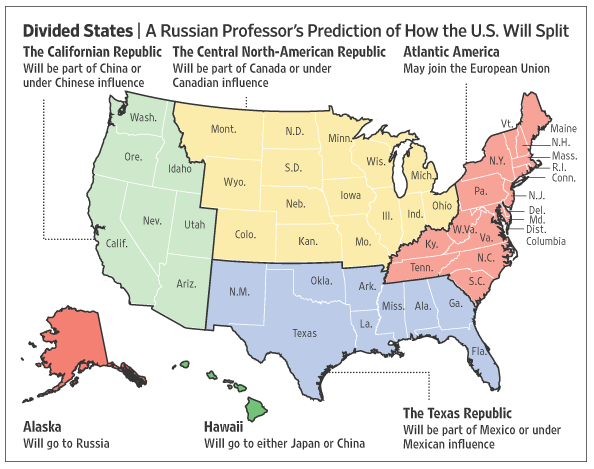 Panarin’s new map of the United States puts the "Californian Republic" under China's influence, "the Texas region" under Mexico's. Hawaii will come under Japanese or Chinese rule, East Coast states will join the European Union, while central northern parts of the US will gradually come under Canada's influence. A less sinister revision of the states that comprise the republic occurred in the 1970s when geography professor C. Etzel Pearcy proposed redrawing the borders of the US states, reducing them from 50 to 38. Pearcy’s framework casts aside the convenience of determining boundaries by using the land's physical features, such as rivers and mountain ranges, or by the simple usage of latitude and longitude. Instead, his realignment gives high priority to contemporary population density, location of cities, lines of transportation, land relief, and size and shape of individual States. 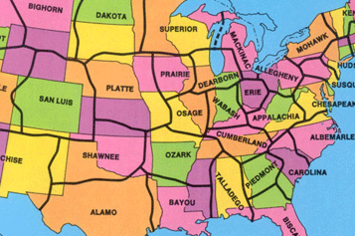 In the current fiscal climate some see the new 38 state map as inspired. According to Pearcy, 25% of the expenditures by states can be attributed to the fixed costs associated with the support and maintenance of state governments themselves. For at least some states this kind of savings could be very appealing right now. Rethinking, reimagining and then redrawing the borders of maps is by no means a new or even fruitless endeavor. That some if not many borders are where they are for seemingly meaningless or irrational reasons is obvious. 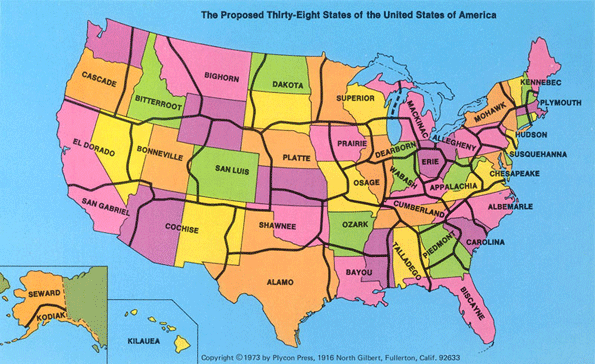 Mark Stein’s How the States Got Their Shapes , for example, documents how natural features like rivers come together with the dreams and schemes of people to create today’s jigsaw puzzle of states. Gerrymandering borders for political, economic or religious reasons is both a historical and contemporary reality. Any economic planner or strategist worth their salt understands, of course, that borders on a map seldom represent or hold sway over how the real economy operates. Sure there are tangible differences in taxes, regulation and all the things that make up a business environment. But like water, economic activity goes where it wants and finds its own level. This has lead to an increasing amount of policy attention being given to cross-border territories of regions, zones, corridors, clusters, networks and the like. One of the more reasoned, enduring efforts to make sense of a borderless economic and cultural landscape is Joel Garreau’s landmark work on the The Nine Nations of North America . My 27 year-old copy’s dust jacket asks the reader to forget the traditional map and consider the way North America really works because new realities of power and people are remaking the continent. A recent conference on USA/Canada cross-border economies in the Great Plains confirmed that Garreau’s analysis continues to influence thinking on regionalism. The longevity of his regions lies not only on their basis in actual data but also tied to the distinct “prisms” though which each nation sees the world. 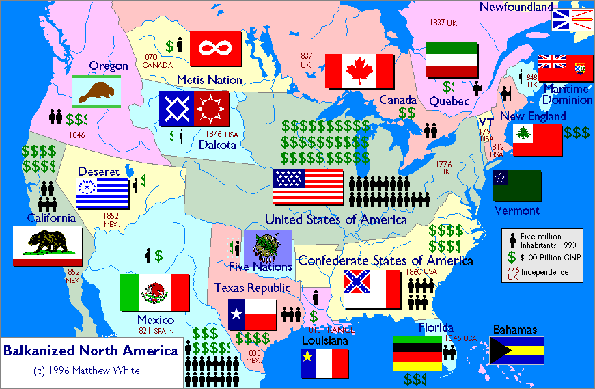 What could have been in North America, instead of how things really are, is the subject of Matthew White’s 1997 map of a balkanized continent. Here the basic premise is that, in an alternate history beginning in 1787, the westward expansion of the Anglo-American people proceeded pretty much as it did, but the United States government just couldn't hold the country together against separatists. How North America really works and how that is manifested spatially has generated growing interest of late and is reflected in the emergence of cross-border networks and organizations. The government of Canada recently issued an exhaustive report titled The Emergence of Cross-Border Regions Between Canada and the United States: Reaping the Promise and Public Value of Cross-Border Regional Relationships. Here the interest is certainly not on redrawing the borders but on recognizing and building on shared socio-cultural values and furthering relationships between businesses, first and foremost, and universities. Mostly a bottom-up phenomenon, these cross-border regional relationships are evidenced by the growth of both informal relationships and formal networks and a rise in cross-border regional co-operative mechanisms. From a policy standpoint the existence of cross-border regions requires new ways of thinking about development, going well beyond our parochial perspective. And this sort of thinking is important because regions – like economic fields of activity – represent the primary theatre in which most activities of international trade and economic integration actually take place. Thematic maps that reconfigure our geography can intrigue and fascinate us. They are really, as some have said, graphic essays that portray spatial variations and interrelationships of geographical distributions. As noted by Norman Joseph William Thrower in Maps and Civilization: Cartography in Culture and Society , thematic maps use the base data of coastlines, boundaries and places, only as point of reference for the phenomenon being explained. Sometimes maps can inspire and motivate us by helping to more fully understand the geography of our economic and demographic challenges and opportunities. Perhaps most importantly thematic maps tell a story about places. Some describe the way things really are now while others express a vision of the future. In both cases they can be a graphical point of departure for plans and actions that help us to make the places we inhabit better places to live and work. Submitted by jakdown89 on Mon, 10/07/2013 - 09:40. Submitted by khare on Thu, 08/08/2013 - 06:11. EC at Pasir Ris Fill up your weekends with endless activities with options like a nice stroll down the beach and park, stay in a chalet or a ride the waves in a sail. Whether you are a nature lover, a beach enthusiast or a leisure seeker, Sea Horizon is the perfect home for you. Submitted by backpack on Sun, 07/07/2013 - 21:33. Submitted by khare on Tue, 06/25/2013 - 12:28. Submitted by khare on Mon, 06/24/2013 - 06:34.
flavia del monte All-Belly Pregnancy Program: How To Eat And Exercise When Expecting To Stay Fit, Have A Strong, Healthy Baby, And Be One "Hot Mama"! This site is a leading resource for information about the Ryan Watson and Flavia Del Monte All Belly Pregnancy PDF book, diet manual, and exercises for pregnant women that help you carry your pregnancy weight with ease, prepare you for giving birth and beyond, and help you keep your baby healthy and happy inside the womb. Submitted by khare on Wed, 06/19/2013 - 12:44.
family survival guide The Family Survival Course: Jason Richards Provides The Blueprints For Up To 7 Years Of Total Independence During Any Crisis. This site is a leading resource for information about the Jason Richards Family Survival Course PDF book and survival techniques to help you and your family thrive during any crisis. Submitted by khare on Sun, 06/16/2013 - 13:39. Submitted by khare on Sun, 06/16/2013 - 12:22.
gmo foods - http://www.gmo-foods.com Ever hear of GMO – genetically modified organisms? A lot of you are most likely wondering what these are or have never even heard of them. These GMO are in products where the genetic makeup has been altered through genetic engineering. Many Americans including myself are concerned about the spread of genetically modified organisms throughout agriculture, and the fact that there is no current requirement in this country for labeling of GMO foods. Submitted by khare on Sun, 06/16/2013 - 12:21.
ocala business Well, Office Metadata is a business directory for the best Central Florida businesses. Our staff patronizes every business personally before writing a short post of our thoughts. There is no negativity here. If a business is not up to par, we do feature it and we don’t recommend it. Submitted by khare on Fri, 06/14/2013 - 18:14.
the girlfriend activation system The Girlfriend Activation System: How To Get A Girlfriend Step-By-Step Using "Literotica". This site is a leading resource for information about the Christian Hudson Girlfriend Activation System PDF book and attraction system that teaches you how to turn a girl you like into your loyal and committed girlfriend.